This month, there have been some subtle but important changes made in the Yeshiva University Cafeterias. As part of our annual Earth Week initiative, signs were put up in key locations in our cafeterias with important information about recycling, including images of recyclable items. It’s amazing just how many of the utensils and containers we use to eat every day are recyclable! Most students are pretty diligent about recycling plastic bottles, but our responsibility goes far beyond that. From forks to sushi boxes to salad bowls, every rigid plastic item in our cafeterias is recyclable in New York City, not to mention glass bottles and aluminum foil. Now there are signs on every utensil dispenser reminding students that cutlery is recyclable. The coke bottle recycling bins in our cafeterias look cool, but the hole seems to limit it’s contents to plastic and glass drinking bottles. 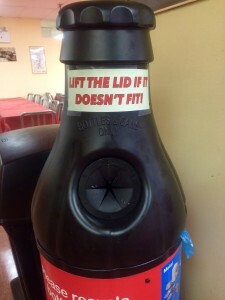 Now every bin bears the words, “If it doesn’t fit, lift the lid!” We should all aim to take the extra 10 seconds to open the tops of those coke bottle bins to put in a larger item such as a salad bowl, rather than toss it in the trash where it will end up in a landfill. Unfortunately, the big items such as hot food containers, salad bowls, and Chinese food containers often end up in the trash in our school. Making a difference is as simple as dumping out whatever you don’t finish and tossing it into a recycling bin. The containers don’t have to be rinsed out or squeaky clean as long as they’re mostly empty. Last but not least, to add a little bit of Earth Week fun to dinner time, interesting food and sustainability facts were displayed on dinner tables on the Beren campus this week. The average YU student may not know it takes 5000 gallons of water to produce one pound of beef, or that the coffee sold in YU cafeterias is certified fair trade. Hopefully the facts increased awareness of of major food & recycling issues or even sparked an interest in sustainability in some students.